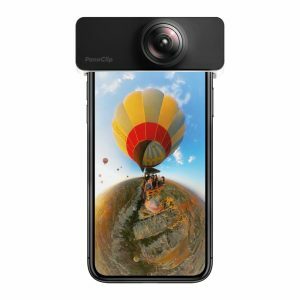 Panoclip ($49.95) turns your smartphone into a 360 camera — one that is easy, quick, and affordable. 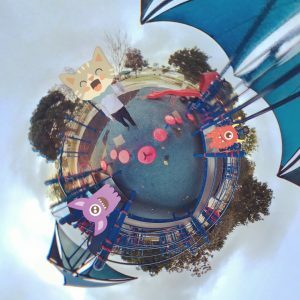 It can also create cool tiny planet animations with your 360 photos. For many people, this could become their first 360 camera. Here is a hands-on report. Everyone has seen 360 photos and tiny planets. Although the number of 360 camera users is increasing, they are dwarfed by the number of smartphone users. But what if you could turn a smartphone into a 360 camera, and make it as easy to use as your smartphone? That’s the idea behind Panoclip — it’s not itself a camera. Instead, it is a 360-degree lens that attaches to your phone (currently available for iPhone 7 and above; Android TBA). 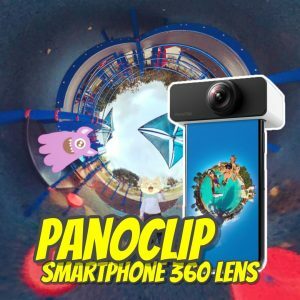 Panoclip slides over your phone and you use its dedicated app to take photos. The app triggers both front and rear cameras almost simultaneously, and fuses the photos into a single 360 photo (on my iPhone 7, the resolution is a respectable 6048 x 3024, or about 18 megapixels). All this takes place without user intervention, and to the user it seems as if the phone has simply become a 360 camera. For users who already have a 360 camera, the image quality is not as good as any decent 360 camera, such as the Samsung Gear 360 2016 (now $68) or the Gear 360 2017 (currently $102), which are true 360 cameras. But 360 cameras have a layer of complexity that can intimidate new users. Photos need to be stitched, and if you want to share them on your phone, the camera has to be connected to your phone. By contrast, with the Panoclip, users may not even realize that the app is stitching the photos. After you take a shot, a thumbnail appears in the gallery, where it is stitched in the background. When you tap on it, you see a 360 view. You can then tap on the Share button to share the 360 photo to Facebook, YouTube, Instagram, Twitter, or your Camera Roll, among others. There is no need to synchronize photos between the camera and your phone because the Panoclip stores the photos in your phone’s memory. 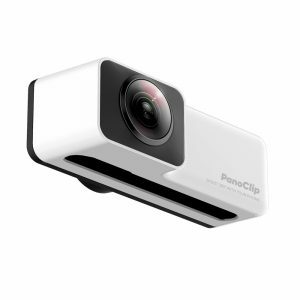 To a user, the Panoclip is about as simple to use as a point-and-shoot camera. That simplicity is, IMHO, its key feature, and for its target market, can be more important than image quality. Check back here for a full review very soon. And if you’re interested in Panoclip, please join the Panoclip group on Facebook. Here is the official Panoclip website. Meanwhile, if you want to see whether you should get a ‘real’ 360 camera instead, check out my video review of the Insta360 One. 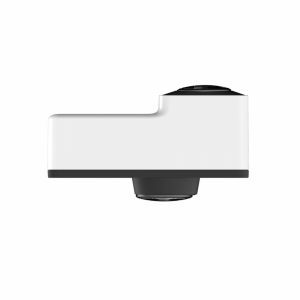 This reminds me of the “Shot VR” – a similar lens adapter for iPhone that was introduced in 2015 in a Kickstarter campaign that was unfortunately unsuccessful. With the number of low-cost 360 cameras available today, I question the relevance of a 360 adapter that must be attached to a phone – especially one that can only be used for stills shots.